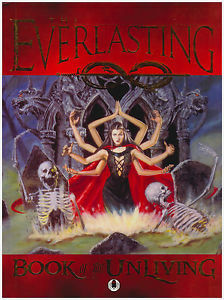 The Everlasting is an RPG – or rather, a series of RPGs, detailing a setting referred to as The Secret World, in which various supernatural entities contend against each other in the shadows of modern-day society. All of the Everlasting core books seem to claim to have some material copyrighted in 1994, but so far as I can make out none were actually published until The Book of the Living came out in 1997. (Two other cores came out in 1998 – Book of the Light and Book of the Spirits – whilst The Book of the Fantastical wouldn’t come out until 2004, after Steven Brown sold Visionary Entertainment to a new investor.) Based on how American copyright law works (in particular, they do a weird thing of having an actual copyright registry, which many countries do without), I suspect what happened was that Steven registered his copyright in his notes for The Everlasting in 1994 – possibly to provide an evidential basis of ownership – and then took 3 years to bring out the new core book, which given that it’s got production standards better than most small-to-midsize press RPGs of the era isn’t too surprising and in fact represents pretty good going on his part. The first core book in the series is The Book of the Unliving, which as the title implies presents a take on the setting focused around (and assuming that you will be playing) an undead creature like a reanimated corpse or one of several varieties of vampire. So far, so World of Darkness ripoff, right? That impression would only be deepened if you happen to notice that the game is billed on its interior title page as Steven Brown’s The Everlasting; for most this would provide a “Who is this guy and why do we care that this is his work?” moment reminiscent of C.J. Carella’s Witchcraft, but some would spot that this is the same Steven C. Brown who penned a bunch of sourcebooks for White Wolf in the mid-1990s. But this would be selling The Everlasting short. Witchcraft presented a sort of World of Darkness heartbreaker where everything felt mild and toned down, which made it uninspiring but at least meant that it backed off from some of the more self-indulgent habits of 1990s White Wolf. The Everlasting goes in the opposite direction – it’s World of Darkness turned up to 11, with a vastly overinflated sense of its own importance and cultural significance that makes Vampire‘s waffling about how it was rekindling a tradition of oral storytelling from Caveman Times seem downright humble.